Male contestants for Mr. Watkins Mill pose for a group picture. 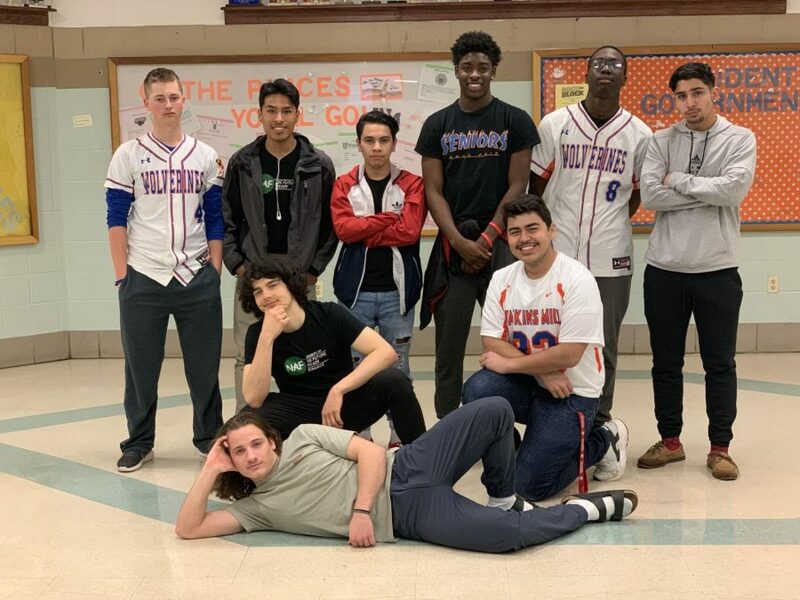 Watkins Mill’s Students Against Destructive Decisions (SADD) will be holding the 31st annual Mr. Watkins Mill competition on April 25 at 7 pm in the auditorium. Tickets will go on sale for $3 at STEP from April 8-12 and April 15, 16, 23, and 24. Tickets will also be sold at the door for $5. Online ticket purchases are also an option this year. A link will be posted to access the online purchase, where staff and students can buy tickets and pick them up in the media center conference room. The winner decided by the judges will bring home the Mr. Watkins Mill title and choose a charity to donate the proceeds to. This year’s theme is 2000s, so break out the inner Regina George. This year’s contestants are seniors Brady Allen, Brennan Guilds, Dejion Martin, Geovanny Canizalez, Isai Flores, Devion Bridges, Joseph Almingor, Brice Eka, Joseph Kamara and Phillip Kostin. The contestants have been working very hard on learning their moves and perfecting their talents. Senior A’shanti Roger has been working with the contestants and their escorts and choreographing the group dances. “Practices are going well, it’s more of a fun environment than all work hard since we have such goofy boy candidates. But we still get a lot done regardless of all the jokes 24/7,” Roger said. The event will be hosted by seniors Alexandra Aucoin and Khava Tsarni, with Spencer Neill and Andy Deleon as audience correspondents. “I feel excited to have the opportunity to help host this special event as a senior,” Deleon said. The night will begin with the introductions of the contestants and their escorts, which will lead into the first group dance. Contestants will then show their talent to everyone during the talent portion. After the contestants share their secret talents with the audience, they will participate in a Q&A to try and win over the judges. History teacher Thomas Sneddon, English teacher Christopher Smith, English teacher Sara Confino, Science Resource teacher Matt Reese, School Resource Officer Marshall Wiedner and MoCo Show/Snow creator Alex Tsironis will judge the competition this year. To end the night and try to win over any last points, the boys will have another group dance prepared. “Honestly I’m not really sure who will win, I’m not concerned about winning. I’m just concerned about the message I give and how the audience is going to feel,” Kostin added. “I can’t wait to see what the boys have in store for us, it took them long enough to come up with what they wanted to do, let’s hope it all pays off,” Aucoin said. Doors open at 6:30 pm, so make sure to get there early to get a good seat.